Moments Mall is a shopper’s Paradise. This is an ultimate stop to discover,what to buy and where to shop till you drop . At Moments you will find everything from Trendy Clothes to Footwear, from Cosmetics to Accessories and from Electronics to Household Products . Not only this, Moments Portfolio includes a Del 15 Food Court, Retail Spaces , Entertainment Zones, and other attractions available for 365 Days a year all under one roof. The shopping Centre is developed and brought to Central West Delhi by Delhi based group Anant Raj Limited. Moments Portfolio is spread over an area of approximately 600,000 sq. ft . The Mall not only showcases multiple retail stores, but also takes care of other requirements of a shopper to enhance the overall experience of shopping ,eating and entertainment . Moments Mall attracts customers from across the city and is strategically located on Patel Road one of the most prominent arterials road connecting West to Central and South Delhi. It is easily accessible to both Residents of the city and the guests visiting New Delhi. . It is well connected with Delhi Metro Rail and is situated at close proximity to Kirti Nagar Metro Station. 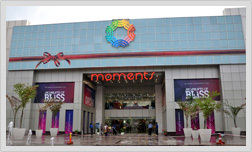 A comfortable ,exciting and rewarding shopping experience awaits the customers visiting Moments Mall.